Midweek meals are the worst to sort out at the moment – mainly due to lack of time and the trillions of other jobs that need doing. I normally don’t start to think about dinner until after lunchtime, and then struggle to make anything of nutritional value due to lack of ingredients and creativity! 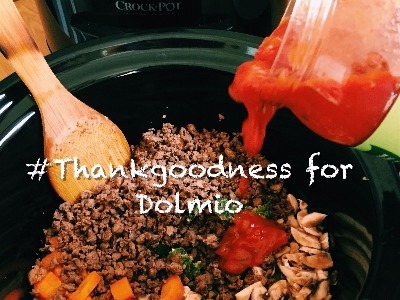 Step in Dolmio and Britmums, and their #Thankgoodness challenge. 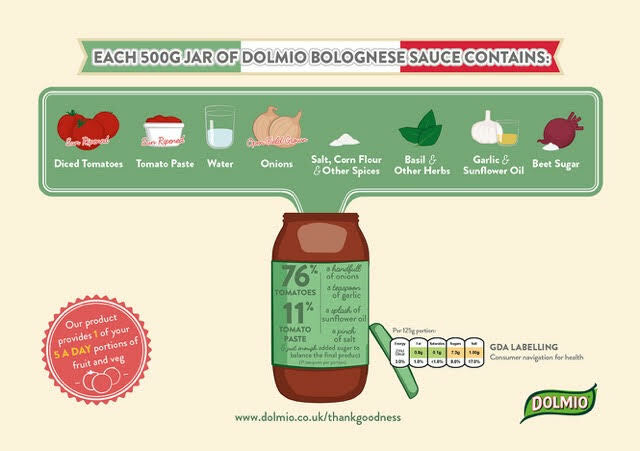 I used to use Dolmio sauce quite a lot during my university days, and then stopped using it so much when someone told me that it wasn’t “good for you”. I was therefore pleasantly surprised to find out that actually, it is 100% natural. A jar provides a family of four with one of their 5-a-day each and that’s before you add any further veg to the meal! This discovery has made my midweek meal planning much easier in terms of time, and got the creative juices flowing in terms of meal planning. We’re having a bit of a health kick in our house, and i’m trying to pack in as many vegetables as possible into each meal – even though we have kicking and screaming (by the big man of the house!) – and I was struggling to find recipe ideas that he would go for that wasn’t purely a salad / tasteless meal. 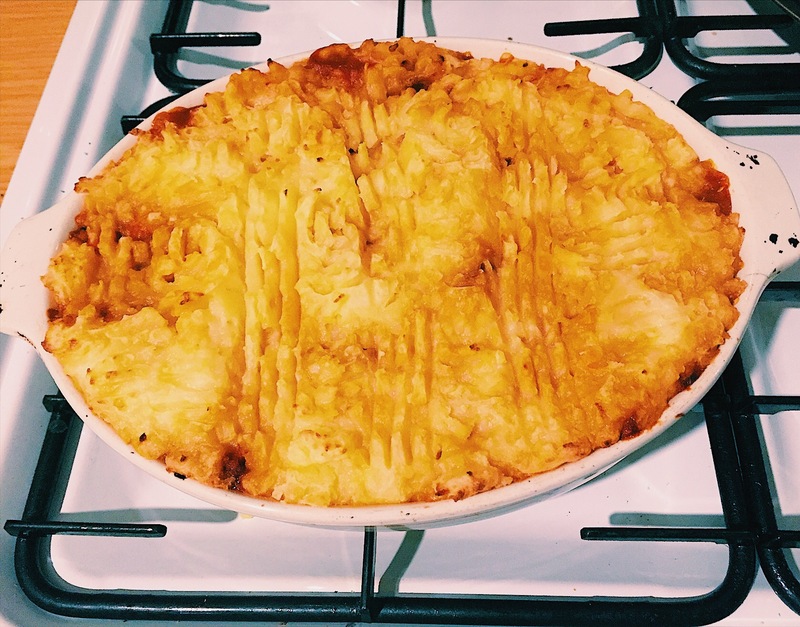 Our first meal was a shepherds pie loaded with extra veg (which he didn’t even notice! ), AND I managed to use Soya mince for it which went unnoticed too – double bonus! Put a small amount of oil in a pan, and add the garlic and chilli. Since becoming a mum, I have found that cooking can be difficult if the little one is having a bad day – especially in terms of stirring dishes every 5 minutes or so. A few of my mum friends had told me that they routinely use a slow cooker, so off to my trusted friend Amazon I went, and the next day a Crockpot landed on my doorstep. 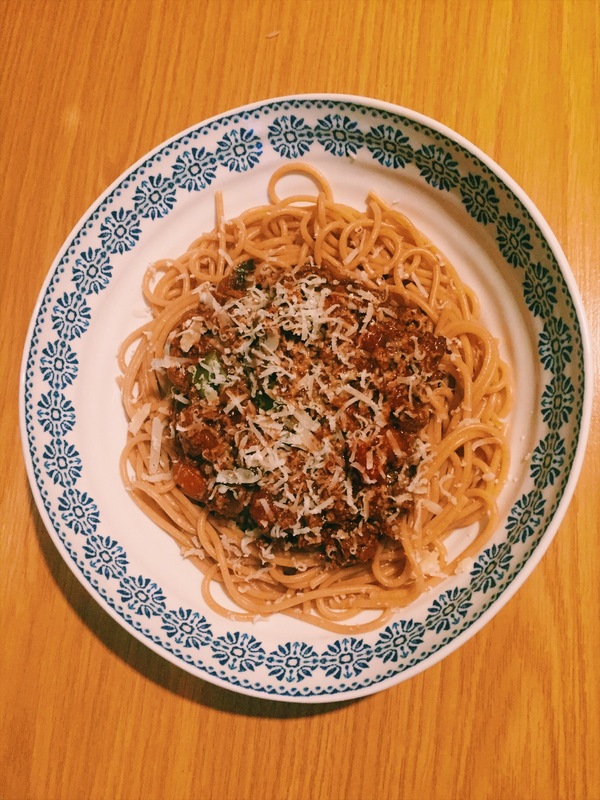 A few days later I decided to make another midweek must have – spaghetti bolognese. I still had veg in the fridge, so decided to make use of it. I wasn’t sure how this would go down, as normally we don’t add any veg to a spaghetti bolognese! It’s normally meat, meat meat in this house. 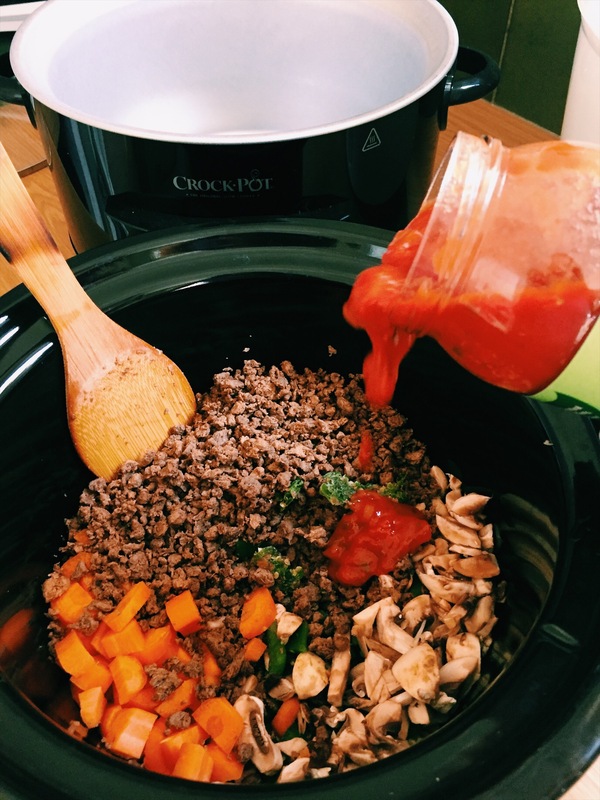 On that particular day I had a VERY fussy baby so thought I would try making the spaghetti bolognese in the slow cooker – and it worked brilliantly! I made far too much so have been able to freeze some for lunches when I don’t have time to make myself anything decent to eat. I served the spaghetti bolognese with WHOLEWHEAT spaghetti and used SOYA MINCE, and no one battered an eyelid – hurrah! Had I suggested using any of the above ingredients, I would have been greeted by a turned up nose and an outright refusal. I’m very happy with the easy midweek meals I have created so far, and have found that Dolmio have lots of recipes for meals made using their bolognese sauce on the website – go and take a look! http://www.dolmio.co.uk/recipes.aspx I’ll be making some of these in the next few weeks! 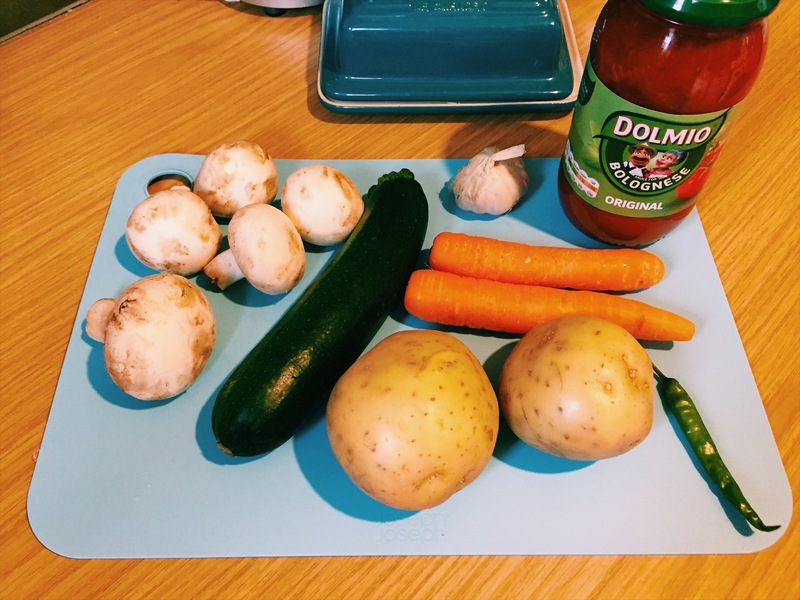 Thank you Dolmio and Britmums for helping me create some fabulous midweek meals AND get some well needed veg into the family! Thanks – loved it, and it truly did inspire me!